And it came to pass, that, as the people pressed upon him to hear the word of God, he stood by the lake of Gennesaret, and saw two ships standing by the lake: but the fishermen were gone out of them, and were washing their nets. And he entered into one of the ships, which was Simon’s, and prayed him that he would thrust out a little from the land. And he sat down, and taught the people out of the ship. Now when he had left speaking, he said unto Simon, Launch out into the deep, and let down your nets for a draught. And Simon answering said unto him, Master, we have toiled all the night, and have taken nothing: nevertheless at thy word I will let down the net. And when they had this done, they inclosed a great multitude of fishes: and their net brake. And they beckoned unto their partners, which were in the other ship, that they should come and help them. And they came, and filled both the ships, so that they began to sink. When Simon Peter saw it, he fell down at Jesus’ knees, saying, Depart from me; for I am a sinful man, O Lord. For he was astonished, and all that were with him, at the draught of the fishes which they had taken: And so was also James, and John, the sons of Zebedee, which were partners with Simon. And Jesus said unto Simon, Fear not; from henceforth thou shalt catch men. And when they had brought their ships to land, they forsook all, and followed him. Our Lord was preaching in His homeland when He employed this phase. Approaching the Sea of Galilee, He watched as some rather frustrated fishermen were bringing their boats back to the shore. Among them were two sets of brothers—Peter and Andrew, and James and John. It is with these simple fishermen that Our Lord began to implement His plan. He used one of the boats as a pulpit. Then He requested Simon to head for the middle of the lake, the deepest part, and once again let down his nets. Simon, though perhaps initially insulted by this advice, obeyed the Lord. And lo and behold, the catch of fish now was so great that the nets began to break, another boat was summoned, and both of them began to sink from the sheer weight of the caught fish. Simon couldn’t believe his eyes! He immediately fell down before the Lord in humility, telling Him essentially that he (Simon) was not worthy to be graced by such an awesome and almighty power. But Jesus said to him; “Fear not, from now on, you will catch men.” And the reading concludes, “when they had brought their boats to land, they forsook all and followed Him.” Mission accomplished! Phase One of Christ’s plan was complete. He had succeeded in enlisting the support of others—apostles who would serve as His ambassadors in subsequent phases of His Divine Plan for the salvation of the world. Notice here a couple of things in particular which pertain to all of us as apostles of Christ. First, Our Lord calls the fishermen “at work.” They’re doing what they do to earn their livelihood! There’s wisdom in this for us. Christ wants workers as His disciples. Those prone to idleness or laziness need not apply! 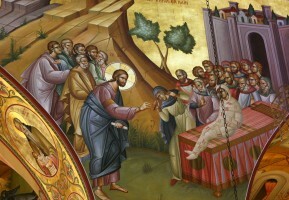 He must be surrounded by what Saint Paul calls “fellow workers with Him.” It’s been said by many that one of the greatest stumbling-blocks to the growth of the Church today are “pew potatoes”—those who find their way to the Sunday Liturgy but fail to pray or work for the Kingdom of Christ once they leave. Christ calls workers! Next, notice the humility and obedience of the fishermen. These are essential qualities of fellow-workers of Christ. 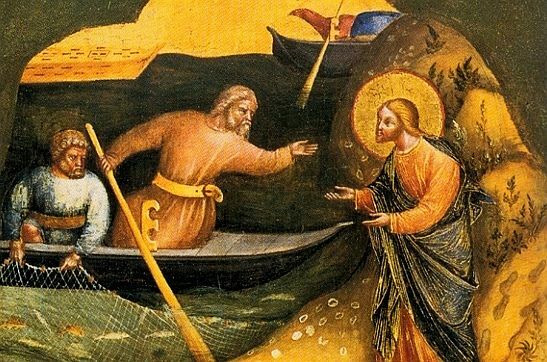 When Christ told Simon to go out into the middle of the lake, after going all night without catching a single fish, Simon could very easily have shunned the request and said something to Jesus on the order of; “Who do you think you are, telling me, a professional fisherman, how to fish? !” But nevertheless, he obeyed Christ. This is a lesson in faith for us! Regardless of our life experience, we must exercise obedience in faith; even though it may appear in the eyes of the world as foolish, fanatical, old-fashioned or irrelevant. Faith implies a humility that accepts and embraces the commands of God and acts accordingly. Historically, this referred to the Jews and the Gentiles. The Jews were those “close to the shore” who, with the benefit of the entire Old Testament, should be easily “caught” in the net of Christ. It was the Gentiles who were “out in the deep”—those who would need to be persuaded and convinced of God’s love through the person of Jesus Christ and His fellow workers! This symbolic meaning needs to be updated because it’s an evangelical challenge confronting the entire Church to this day. For example, most, if not all, of our “parish nets” have been successful in “catching those close to the shore.” By the grace of God, we welcome among us numerous souls who have had no prior exposure to or familiarity with the Orthodox Church, but who courageously venture into our temples and ultimately are “hooked” (increasingly, these days, after having done their homework via the internet before risking a foot in the door!). We don’t have to do a whole lot of “fishing” to catch them. In most cases, all we have to do is “let down our net,” offer the opportunity, provide the facility, beauty and environment of the Church, and in they come! It’s in accordance with this solemn profession that every one of us who is in communion with Christ and His Church must act! We’re all supposed to be “fishers of men!” Yes, Our Lord is still ‘the point-Man’ in His strategic plan for the salvation of the world. But each time we gather as His Body, the Church, we’re reminded that He expects us to be His dedicated ambassadors and tireless workers—humble and obedient fishermen—to help execute His Plan—to catch a great catch for the Kingdom and glory of God!